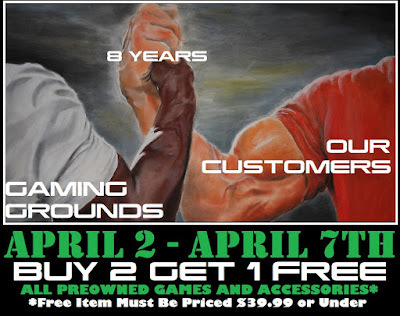 Gaming Grounds has been open for eight years now. E I G H T (eight) YEARS! We want to thank each and every customer that has come in and shopped with us over the past eight years. We've said it before and we'll say it again - we're not a big box store, and our success is entirely because of you. It hasn't always been an easy ride, but we're so thrilled to serve the Southeast Missouri area and we really feel like we are part of this community in ways no other store could be. We've grown a lot in eight years, but one thing remains the same - we want to provide you with the best games, the best service, and help you make the best memories that we can. Thank you so much for your continued support. We also want to thank all of our amazing employees, past and present, who put in the blood, sweat, and tears to make this store what it is today. In honor of this milestone, we want to offer all of our friends, family, and supporters a little something extra. Starting today and ending at close on Sunday, we're offering a Buy 2 get 1 Free deal on ALL of our preowned games and accessories, mix and match to your hearts content, as long as the free item is $39.99 or under. Thank you all once again for being there for us. Here's to another year of gaming together! So we might have shocked/appalled/excited some of our customers with that weekend deal featuring Top Tier Sonic & Tails. You just weren't ready for it. We ended up cancelling our cross promotion with Momo because of it, but hey, you live and learn when it comes to business. So to make up for the nightmares, we're offering you a deal that EVERYONE can enjoy! Starting today and ending at close on Sunday you can stock up on titles for one of the most versatile and beloved consoles of all time - the Playstation 2! It's BUY 1 GET 1 FREE on all of our used PS2 titles! Now we only have around 3000 PS2 titles, so make sure you get in soon to take advantage of this amazing deal! !